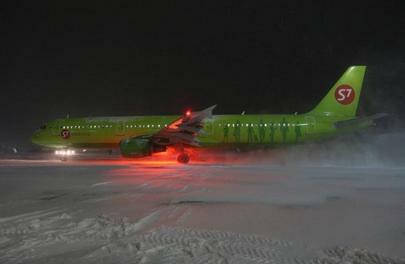 S7 Airlines has announced it has added one more Airbus A321 narrow-body to its fleet. The aircraft seats 198 passengers—8 in business and 190 in economy class. Leased from the Irish SMBC Aviation Capital Limited, the aircraft made its first commercial flight with the new operator from Moscow to Tbilisi on May 26. According to open sources, the 2.7-year old A321 with tail number VP-BPO was previously operated by UTair, which suspended operation of the type under its fleet optimization strategy. S7 Airlines also confirmed they are expecting delivery of one more similar aircraft, in line with its fleet renewal program. The second aircraft, 2.5-year old VP-BPC, was also operated by UTair. S7 Airlines’ fleet includes 45 Airbus A320 family aircraft (20 A319s, 19 A320s and six A321s) and two Boeing 767 wide-bodies. The carrier became the first Russian airline to place an order for the re-engined Airbus A320neo family, with deliveries scheduled to start next year. S7 Airlines has A321neos on order and an LOI for two A320neos, and has signed an operational leasing agreement with Air Lease Corporation for these aircraft. The A321neos are expected to replace the two Boeing 767s, the easing term for which expires in the fall of 2017. In the future, within 10 to 12 years, S7 Airlines plans to completely re-equip its fleet with neos.